Cut two chickens as for fricassee, wash them clean, and put them in a stew pan with as much water as will cover them, sprinkle them with a large spoonful of salt, and let them boil till tender, covered close all the time, and skim them well ; when boiled enough, take up the chickens, and put the liquor of them into a pan, then put half a pound of fresh butter in the pan and brown it a little ; put into it two cloves of garlick and a large onion sliced, and let these fry till brown often shaking the pan ; then put in the chickens, and sprinkle over them two or three spoonsful of curry powder ; then cover the pan close and let the chicken do till brown, often shaking the pan ; then put in the liquor the chickens were boiled in, and let all stew till tender ; if acid is agreeable, squeeze the juice of a lemon or orange in it. One ounce turmerick, one do. coriander seed, one do. cumin seed, one do. white ginger, one of nutmeg, one of mace, and one of cayenne pepper ; pound all together, and pass through a fine sieve ; bottle and cork it well ; one teaspoonful is sufficient to season any made dish. Take a pound of rice, wash it clean in salt and water, then put it into two quarts of boiling water, and boil it briskly twenty minutes ; then strain it in a colander and shake it into a dish, but do not touch it with your fingers nor with a spoon. Beef, veal, mutton, rabbits, fish, &c. may be curried and sent to table with or without the dish of rice. Curry powder is used as a fine flavored seasoning for fish, fowl, steaks, chops, veal cutlets, hashes, minces, alamodes, turtle soup, and in all rich dishes, gravies, sauce, &c. &c.
My first response when I read this recipe was “Yum!” In addition to the chicken she and her cooks anticipated using this curry powder in all sorts of savory dishes using many kinds of meats. Her list of possible variants at the end of the recipe gives a clear idea of the broad range of skills her enslaved cooks brought to this array of preparations. I’d venture that chunks of eggplant, or cubed steamed summer squash, or even firm tofu would be lovely cooked in this manner. 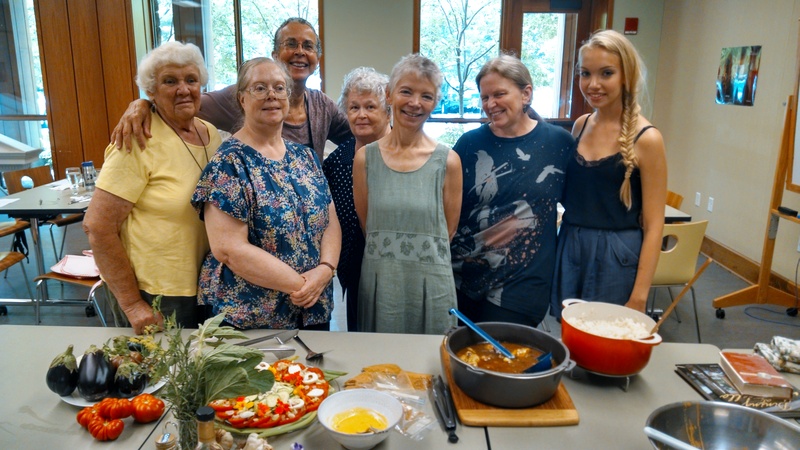 In the summer of 2014 at a Monticello inspired culinary workshop my students and I prepared this chicken curry dish, Basmati rice, Randolph’s Tomata Marmalade, and her salad with Tarragon Dressing. What a wonderful feast it was.